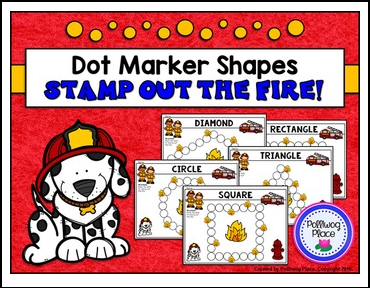 This Fire Safety Dot Marker Shape Activity focuses on identifying shapes. Each page features a large shape made of dots. Students stamp out the fire by dabbing their dot marker (or bingo dauber) around the shape. There are five different shapes: square, rectangle, circle, triangle, and diamond. I am including a rhombus page as an alternate name for diamond. This is a low-prep activity. Simply print and go. Each page comes in both color and black lines. Laminate color pages and use with a dry erase marker for a dab and wipe activity. Alternate Idea: You can also cover the dots with small math counters or paly dough. This Fire Safety Dot Marker Shape Activity is a fun and engaging way to practice key language skills for young learners.